Adafruit customer service forums • View topic - Reset Xbee? I purchased the kit for Tweet-a-watt, and accidentally set my 'reciever' Xbee unit as a transmitter unit. Now it sleeps ever two seconds (like the transmitter should), but I can't seem to find a way to reset the Xbee's configuration. X-CTU gets an error when trying to read/write the configuration. Can someone help me with this? jerrya posted this a while back and it worked for me. - Click on Show defaults and Write. Thanks, but I only have the tweet-a-watt kit, and no developer board. Can it be done with what I have? Tobrew wrote: This worked for me when the reset trick refused to. I have the same problem with my two Xbee. I use one adafruit adapter ( http://www.adafruit.com/index.php?main_page=product_info&cPath=29&products_id=126&zenid=50a0e2b2d9ec4375c42ce270568895bb) with an FTDI 3V3 cable ( http://www.adafruit.com/index.php?main_page=product_info&cPath=33&products_id=70&zenid=50a0e2b2d9ec4375c42ce270568895bb) and the last X-CTU soft. At the begining, the two Xbee worked well without any bug. I have upgraded them with firmware 10E6 with no problem after this upgrade. The two doesn't answer to any line command or read and write. The baud rate is 9800-8-N-1. I try "Tobrew" setting with no success. Here is two screen shoots of X-CTU software. 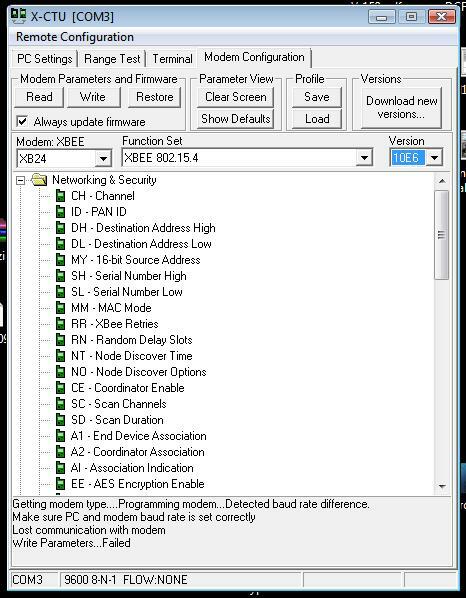 it says "Detected Baud Rate Difference"
did you change to different baud rates? 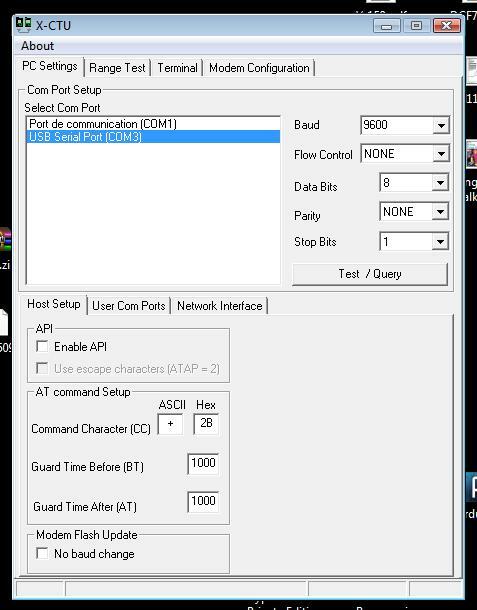 I try all baud rate from 1200 to 230400. Perhaps FTDI cable is out ? I try a serial sniffer all seems good. I cannot understand why he lost modem communication ! I will try without adafruit shield. As FTDI cable logic level is 3.3 V, I will shunt the SN74AHC. Ok, I try an other FTDI cable. My two Xbee are OK ! So, I will change my FTDI 3.3V TTL cable. Having just gone through the Xbee reset hell myself, I'd like to add a bit to the discussion. It's a hardware issue. I tried a different FTDI cable, I tried a different (Parallax) adapter board, I tried every combination of settings suggested on the many dozens of web pages that discuss this problem, and I tried some of them over and over and over, I bought more modems and bricked another (before I thought of solution #1 below). 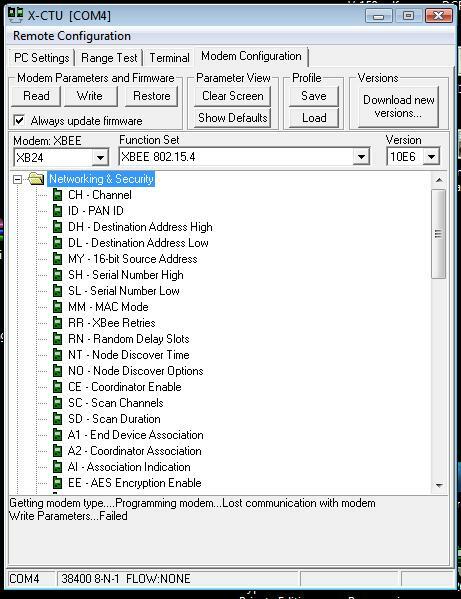 Nothing would get me past the errors, sometimes the error was "detected baud rate difference", sometimes it was a failed checksum, and I think there was one other, but they were all the same thing, I could not update the firmware on my Xbees. Solution number one: DO NOT UPDATE THE FIRMWARE ON YOUR Xbees! Seriously. I haven't bothered to find out yet what exactly the difference is between 10EC that came on my new modems and 10ED - the latest - but, there is very little chance that the difference is significant enough to affect my intended use in the tweet-a-watt kit. There are many places in the software world where it is very inadvisable to be on anything but the latest version, but this isn't one of them. I could have had my tweet-a-watt up days sooner and put off a lot of learning about Xbee until later. It would be great if someone could change the tweet-a-watt instructions to remove the suggestion to start with a firmware upgrade. Solution number two: get yourself a Digi brand adapter board. I still had to use the pull the modem out, click send, wait for the error pop-up, put them modem in trick to get X-CTU to upgrade the modems - but they both upgraded on the first try. I don't know what it is about the third-party Xbee adapter boards (may investigate that later) but the two different ones that I tried (Adafruit and Parallax) are not effective at upgrading Xbee firmware. I did buy the adapters directly from Digi when I started to play with XBees. With these I never had a problem setting the parameters or updated the firmware. Digi does have the schematics for their adapters available to download for anyone wishing to see how they did them. Here's what works for me in this exact order. 5) Remove ground from reset line. XCTU popup box should close by itself. At this point the assoc LED should be blinking continuously. 6) XCTU will now show a completely blank config for the XBee. Press 'read' in XCTU and you should see all of the default modes enabled. Whatever was in there earlier just got erased.